To validate their findings, the researchers screened eight patients with CLL for the early memory T cells before and after CAR T-cell therapy. Complete responders were identified with 100% specificity and sensitivity. Immuuntherapie met gemoduleerde T-cellen, Chimeric antigen receptor (CAR) T-cell therapie genoemd, geeft bij verschillende vormen van kanker goede resultaten. Bv. bij ALL - Acute Lymfatische Leukemie geeft CAR-T cel therapie zeer goede resultaten met 87 procent die een complete remissie bereikte in een fase II studie. Bij een andere vorm van leukemie, CLL - Chronische Lymfatische Leukemie slaat CAR-T cel therapie ook wel aan maar veel minder goed (ca. 25 procent complete remissies) dan bij ALL. Onderzoekers hebben een analyse gemaakt van welke genenmutaties wellicht daarin het verschil maken tussen ALL tumorcellen en CLL tumorcellen. Uit hun analyse blijkt dat patiënten die gezondere "vroege geheugen" cytotoxische T-cellen hadden, gemarkeerd door de expressie van CD8 en CD27, evenals de afwezigheid van CD45RO, veel meer kans hadden om een volledige of gedeeltelijke remissie door de CAR-T cel behandeling te bereiken. "Onze biomarker, die wordt gedefinieerd als CD27-positieve, CD45RO-negatieve en CD8 + T-cellen in een gemoduleerde T-cel behandeling, kan helpen bij de selectie van CLL patiënten," zegt J. Joseph Melenhorst, PhD, senior study author, J. Joseph Melenhorst, PhD, director, product development and correlative sciences, at the University of Pennsylvania, Philadelphia. "Patiënten met 28,6% van de CD8 + T-cellen die dit fenotype tot expressie brengen, reageerden eerder op CD19-omgeleide T-celtherapie dan patiënten met een lagere frequentie van deze populatie." Melenhorst merkt ook op dat deze selectie gebruikt kan worden om patiënten te selecteren voor een CAR-T cel behandeling. Met de juiste mutaties en expressie is de kans op een remissie veel groter. Ook zegt hij: "
"We hebben ook andere gemoduleerde celbehandelingen in ontwikkeling en biomarker-negatieve patiënten zouden dat als een alternatief kunnen beschouwen." Tolerance to self-antigens prevents the elimination of cancer by the immune system1,2. 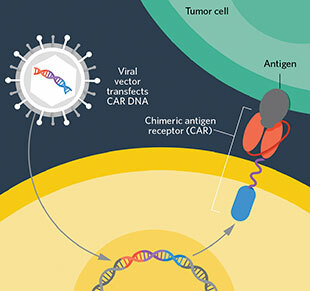 We used synthetic chimeric antigen receptors (CARs) to overcome immunological tolerance and mediate tumor rejection in patients with chronic lymphocytic leukemia (CLL). Remission was induced in a subset of subjects, but most did not respond. Comprehensive assessment of patient-derived CAR T cells to identify mechanisms of therapeutic success and failure has not been explored. We performed genomic, phenotypic and functional evaluations to identify determinants of response. Transcriptomic profiling revealed that CAR T cells from complete-responding patients with CLL were enriched in memory-related genes, including IL-6/STAT3 signatures, whereas T cells from nonresponders upregulated programs involved in effector differentiation, glycolysis, exhaustion and apoptosis. Sustained remission was associated with an elevated frequency of CD27+CD45RO–CD8+ T cells before CAR T cell generation, and these lymphocytes possessed memory-like characteristics. Highly functional CAR T cells from patients produced STAT3-related cytokines, and serum IL-6 correlated with CAR T cell expansion. IL-6/STAT3 blockade diminished CAR T cell proliferation. Furthermore, a mechanistically relevant population of CD27+PD-1–CD8+ CAR T cells expressing high levels of the IL-6 receptor predicts therapeutic response and is responsible for tumor control. These findings uncover new features of CAR T cell biology and underscore the potential of using pretreatment biomarkers of response to advance immunotherapies. The study was supported by funding from the National Cancer Institute, a Stand Up to Cancer Phillip A. Sharp Innovation in Collaboration Award, and Novartis. Melenhorst and several coauthors hold patents related to CTL019 cell therapy. Makkouk, A. & Weiner, G. J. Cancer immunotherapy and breaking immune tolerance: new approaches to an old challenge. Cancer Res. 75, 5–10 (2015). Vesely, M. D., Kershaw, M. H., Schreiber, R. D. & Smyth, M. J. Natural innate and adaptive immunity to cancer. Annu. Rev. Immunol. 29, 235–271 (2011). Brown, J. R. et al. Idelalisib, an inhibitor of phosphatidylinositol 3-kinase p110delta, for relapsed/refractory chronic lymphocytic leukemia. Blood 123, 3390–3397 (2014). Jain, P. et al. Outcomes of patients with chronic lymphocytic leukemia after discontinuing ibrutinib. Blood 125, 2062–2067 (2015). Turtle, C. J. et al. Immunotherapy of non-Hodgkin’s lymphoma with a defined ratio of CD8+ and CD4+ CD19-specific chimeric antigen receptor-modified T cells. Sci. Transl. Med. 8, 355ra116 (2016). Turtle, C. J. et al. CD19 CAR-T cells of defined CD4+:CD8+ composition in adult B cell ALL patients. J. Clin. Invest. 126, 2123–2138 (2016). Kochenderfer, J. N. et al. Chemotherapy-refractory diffuse large B-cell lymphoma and indolent B-cell malignancies can be effectively treated with autologous T cells expressing an anti-CD19 chimeric antigen receptor. J. Clin. Oncol. 33, 540–549 (2015). Kawalekar, O. U. et al. Distinct signaling of coreceptors regulates specific metabolism pathways and impacts memory development in CAR T cells. Immunity 44, 712 (2016). Gattinoni, L. et al. Acquisition of full effector function in vitro paradoxically impairs the in vivo antitumor efficacy of adoptively transferred CD8+ T cells. J. Clin. Invest. 115, 1616–1626 (2005). Hinrichs, C. S. et al. Adoptively transferred effector cells derived from naive rather than central memory CD8+ T cells mediate superior antitumor immunity. Proc. Natl. Acad. Sci. USA 106, 17469–17474 (2009). Betz, U. A. & Müller, W. Regulated expression of gp130 and IL-6 receptor alpha chain in T cell maturation and activation. Int. Immunol. 10, 1175–1184 (1998). Siegel, A. M. et al. A critical role for STAT3 transcription factor signaling in the development and maintenance of human T cell memory. Immunity 35, 806–818 (2011). Lugli, E. et al. Identification, isolation and in vitro expansion of human and nonhuman primate T stem cell memory cells. Nat. Protoc. 8, 33–42 (2013). Bruggner, R. V., Bodenmiller, B., Dill, D. L., Tibshirani, R. J. & Nolan, G. P. Automated identification of stratifying signatures in cellular subpopulations. Proc. Natl. Acad. Sci. USA 111, E2770–E2777 (2014). Aghaeepour, N. et al. Early immunologic correlates of HIV protection can be identified from computational analysis of complex multivariate T-cell flow cytometry assays. Bioinformatics 28, 1009–1016 (2012). Lécuroux, C. et al. Identification of a particular HIV-specific CD8+ T-cell subset with a CD27+ CD45RO–/RA+ phenotype and memory characteristics after initiation of HAART during acute primary HIV infection. Blood 113, 3209–3217 (2009). Dunne, P. J. et al. Epstein-Barr virus-specific CD8+ T cells that re-express CD45RA are apoptosis-resistant memory cells that retain replicative potential. Blood 100, 933–940 (2002). Rufer, N. et al. Ex vivo characterization of human CD8+ T subsets with distinct replicative history and partial effector functions. Blood 102, 1779–1787 (2003). Precopio, M. L. et al. Immunization with vaccinia virus induces polyfunctional and phenotypically distinctive CD8+ T cell responses. J. Exp. Med. 204, 1405–1416 (2007). Kueberuwa, G. et al. CCR7+ selected gene-modified T cells maintain a central memory phenotype and display enhanced persistence in peripheral blood in vivo. J. Immunother. Cancer 5, 14 (2017). Jones, R. B. et al. Tim-3 expression defines a novel population of dysfunctional T cells with highly elevated frequencies in progressive HIV-1 infection. J. Exp. Med. 205, 2763–2779 (2008). Barber, D. L. et al. Restoring function in exhausted CD8 T cells during chronic viral infection. Nature 439, 682–687 (2006). Blackburn, S. D. et al. Coregulation of CD8+ T cell exhaustion by multiple inhibitory receptors during chronic viral infection. Nat. Immunol. 10, 29–37 (2009). Fourcade, J. et al. Upregulation of Tim-3 and PD-1 expression is associated with tumor antigen-specific CD8+ T cell dysfunction in melanoma patients. J. Exp. Med. 207, 2175–2186 (2010). Grosso, J. F. et al. LAG-3 regulates CD8+ T cell accumulation and effector function in murine self- and tumor-tolerance systems. J. Clin. Invest. 117, 3383–3392 (2007). Laport, G. G. et al. Adoptive transfer of costimulated T cells induces lymphocytosis in patients with relapsed/refractory non-Hodgkin lymphoma following CD34+-selected hematopoietic cell transplantation. Blood 102, 2004–2013 (2003). Ruella, M. et al. The addition of the BTK inhibitor Ibrutinib to anti-CD19 chimeric antigen receptor T cells (CART19) improves responses against mantle cell lymphoma. Clin. Cancer Res. 22, 2684–2696 (2016). Fraietta, J. A. et al. Ibrutinib enhances chimeric antigen receptor T-cell engraftment and efficacy in leukemia. Blood 127, 1117–1127 (2016). Luckey, C. J. et al. Memory T and memory B cells share a transcriptional program of self-renewal with long-term hematopoietic stem cells. Proc. Natl. Acad. Sci. USA 103, 3304–3309 (2006). McKinney, E. F., Lee, J. C., Jayne, D. R., Lyons, P. A. & Smith, K. G. T-cell exhaustion, co-stimulation and clinical outcome in autoimmunity and infection. Nature 523, 612–616 (2015). Abbas, A. R. et al. Immune response in silico (IRIS): immune-specific genes identified from a compendium of microarray expression data. Genes Immun. 6, 319–331 (2005). Bangs, S. C. et al. Human CD4+ memory T cells are preferential targets for bystander activation and apoptosis. J. Immunol. 182, 1962–1971 (2009). Ramirez, K. et al. Gene deregulation and chronic activation in natural killer cells deficient in the transcription factor ETS1. Immunity 36, 921–932 (2012). Campia, I. et al. An autocrine cytokine/JAK/STAT-signaling induces kynurenine synthesis in multidrug resistant human cancer cells. PLoS One 10, e0126159 (2015). Jena, B. et al. Chimeric antigen receptor (CAR)-specific monoclonal antibody to detect CD19-specific T cells in clinical trials. PLoS One 8, e57838 (2013). Cawthon, R. M. Telomere measurement by quantitative PCR. Nucleic Acids Res. 30, e47 (2002). Kim, N. W. et al. Specific association of human telomerase activity with immortal cells and cancer. Science 266, 2011–2015 (1994). Herbert, B. S., Hochreiter, A. E., Wright, W. E. & Shay, J. W. Nonradioactive detection of telomerase activity using the telomeric repeat amplification protocol. Nat. Protoc. 1, 1583–1590 (2006). We thank the patients for their participation in the clinical trials from which research samples were obtained. We also acknowledge A. Fesnak, A. Lamontagne, A. Malykhin, C. Corl, Y. Ohayon and other members of the Clinical Cell and Vaccine Production Facility for cell manufacturing and testing. In addition, we are grateful to V. Gonzalez, J. Finklestein, F. Nazimuddin, J.-M. Navenot, M. Bogush, Y. Tanner, N. Kengle, K. Marcucci, A. Chew, C. Pletcher, P. Hallberg and R. Schretzenmair for contributions to correlative studies and/or other research support. D. Campana, C. Imai and others at St. Jude Children’s Research Hospital designed, developed and provided, under material-transfer agreements, the CAR used in this study. B. Jena and L. Cooper (MD Anderson Cancer Center) are acknowledged for providing the CAR anti-idiotype detection reagent. The functional anti-idiotypic antibody that was used for in vitro CAR stimulation experiments was a kind gift from Novartis Pharmaceutical Corporation. This work was supported by funding from NCI T32CA009140 (J.A.F.) R01CA165206 (D.L.P. and C.H.J. ), P01CA214278 (C.H.J), a Stand Up to Cancer Phillip A. Sharp Innovation in Collaboration Award (C.H.J) and Novartis. These authors contributed equally: Simon F. Lacey and Elena J. Orlando. J.A.F., S.F.L., F.B.J., R.M.Y., N.V.F., B.L.L., D.L.S., E.J.W., J.L.B., D.L.P., C.H.J. and J.J.M. designed the experiments and/or performed analysis. J.A.F., M.Gohil, S.L., A.C.B., Y.W., R.S.O., D.E.A., C.Z., N.W., F.B., C.D., F.C., L.T., H.P., M. Gupta, I.K., L.L., J.X., S.H.K., M.M.D. and A.C.H. performed experiments. E.J.O. and H.B. analyzed RNA-seq. data. I.P.-M. carried out the computational analyses of flow cytometric data. W.-T.H. and E.P. performed statistical analyses. J.A.F., C.H.J. and J.J.M. wrote the paper, and all authors contributed to writing and providing feedback. J.A.F., S.F.L., F.B., R.M.Y., B.L.L., J.L.B., D.L.P., C.H.J. and J.J.M. hold patents related to CTL019 cell therapy. These authors declare no additional interests. The remaining authors declare no competing interests. Correspondence to J. Joseph Melenhorst. Reageer op "Nieuwe biomarkers (mutaties CD27-pos, CD45RO-neg.en CD8+) CAR T cellen voorspellen waarom immuuntherapie met T-car cells bij CLL - Chronische Lymfatische Leukemie effectief zal zijn."